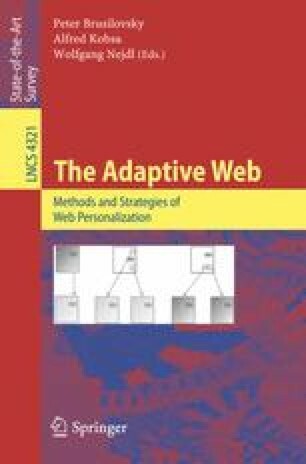 One of the potent personalization technologies powering the adaptive web is collaborative filtering. Collaborative filtering (CF) is the process of filtering or evaluating items through the opinions of other people. CF technology brings together the opinions of large interconnected communities on the web, supporting filtering of substantial quantities of data. In this chapter we introduce the core concepts of collaborative filtering, its primary uses for users of the adaptive web, the theory and practice of CF algorithms, and design decisions regarding rating systems and acquisition of ratings. We also discuss how to evaluate CF systems, and the evolution of rich interaction interfaces. We close the chapter with discussions of the challenges of privacy particular to a CF recommendation service and important open research questions in the field.